B2B sales is a tough game. Always has been; always will be. With the increased reliance on technology, the growing power of the customer and the three dominant sales trends, selling organizations must play from a new playbook; one designed to win in the world we live in today. While there are many traditional habits and approaches that need to be adjusted (or eliminated), very high on the list is the focus of your field sales team. For longer than I’ve been in sales, there’s been the belief that salespeople should sell new business, as well as find the new business to sell. I’ve seen too many good salespeople fail because they’re not successful prospectors. What’s worse, I’ve seen people who could be superstar new business salespeople decide to do something else simply because they have no desire to prospect. If your goal is to create predictable, sustainable and scalable growth, you need to implement a sales model that will allow you to grow consistently, meeting the demands of today and tomorrow. It is for this reason that if your salespeople are also prospecting for new business – they should stop. They’re not good at it, don’t like it and it’s not good for them. Basically speaking there are two types of people involved in successful sales. Those who love getting the conversation started and those that love managing the complex process of getting people to make decisions. Those that are really good at one are not particularly good at the other. That’s not to say they can’t do it; or even that they can’t do it reasonably effective. I spent the first 10 years of my sales career prospecting and closing. While I was effective, the truth was that I prospected just enough to have the opportunities that I needed to meet my own personal target. My effectiveness and energy skyrocketed when I was able to stop focusing on the parts of the sales process that I didn’t like, and instead on the part where I was both passionate and excellent. Selling to business is simply too time consuming, complicated and difficult to be splitting time between the conversations that occur when prospecting and the conversations and business acumen needed to manage a full-fledged sales opportunity. It’s inefficient, costly, ineffective and unhealthy for the selling organization. It puts an artificial limit on growth and capacity. When the functions are mixed, success in one area limits what can be done in the other. This means even when it’s successful it results in inconsistent performance, higher costs and burnout. The success of the salesperson will be limited to their area of weakest ability. The economic model is flawed. You end up overpaying someone when they’re performing in their area of weakness, and underpaying them when they’re working in their area of strength. It’s not good for customers. The number one concern that is expressed to me by executives is that they’re worried about having multiple people involved in contacting customers. They’re concerned it will be confusing. The problem with this concern is that it doesn’t meet the reality test. Decisions are highly bifurcated within organizations and multiple people on the buy-side are going to be involved. Therefore, adding people to the sell-side merely balances the equation. Additionally, customers don’t care who they talk to, they only care about the value of the conversation. In the sales world today, you oftentimes have to build some consensus lower in the organization before the upper-level, decision-making executives are open to getting involved. Utilizing inside sales people to manage those opportunities is not only more effective for your organization, it’s also in alignment with how customers work. It has the added benefit of allowing you to properly invest – both in time and acumen – of your field sales team, so that prospects are properly treated and managed through the sales cycle. CAVEAT*: The statement salespeople shouldn’t prospect does not mean that salespeople don’t have top-of-the-funnel work to do. The job of the lead management team is to create sales qualified leads. The field sales person still needs to generate interest and build consensus within the prospect’s organization. 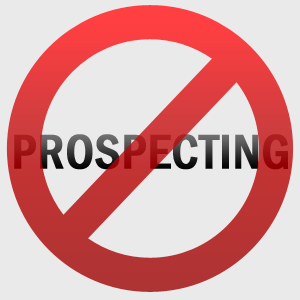 Additionally, there is one exception to the no prospecting rule. A focus on penetrating strategic accounts is okay, so long as it is highly focused and limited in terms of the amount of time needed from the rep.